I am an artist based in Wales. I was born in Mid-Wales and moved to Pembrokeshire when I was eight years old. I graduated with BA Hons in Fine Art at U.W.E Bristol in 2002 and returned to Pembrokeshire where I have lived ever since. 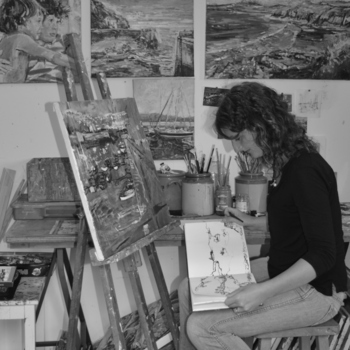 I love to draw at every opportunity and am continually inspired by my surroundings, the amazing landscapes, from the atmospheric Preselli mountains and the stunning, dramatic coastline to everyday experiences of the world around me. Living next to the Cleddau Estuary, where nothing stands still, is a constant inspiration. I'm never without my sketchbook, drawing family, friends, objects of interest, recording the impression of the moment. My aim is to capture my experience in an individual style, hoping to provide the viewer with a different, fresh perspective. I am fascinated by colour and mark making and I am continually experimenting, taking inspiration from other artists' work and ideas. I like to get involved with community led art projects whenever possible. I enjoy the challenge of helping others to express themselves through the arts particularly when they may not have the confidence to do so. I've worked on many community art projects involving primary and secondary schools, youth groups, care homes and provided workshops for organizations and local events such as Span Arts and Milford Haven Fish Festival. I've also worked on private commissions and various murals for public places within Pembrokeshire.